Here is a comprehensive list of answers to the most often asked questions about alcohol, alcoholism, and substance abuse. They provide information to better understand the health consequences of alcohol use disorders. Consult your physician or healthcare provider if you think you or a loved one has an alcohol problem. There isn't an official diagnosis called alcoholism. What the entire world knows as alcoholism is officially known as an alcohol use disorder. So, what are we referring to when we use the term "alcoholism?" Alcoholism is a chronic, often progressive disease with symptoms that include a strong need to drink despite negative consequences, such as work or health problems. Like many other diseases, it has a generally predictable course, has recognized symptoms, and it's influenced by both genetic and environmental factors that are being increasingly well defined. Alcoholism tends to run in families and genetic factors partially explain this pattern. Researchers are finding genes that influence vulnerability to alcoholism. Your environment, such as the influence of friends, stress levels, and the ease of obtaining alcohol, also may influence drinking and the development of alcoholism. Other factors, such as social support, may help to protect even high-risk people from alcohol problems. Alcoholism is a treatable disease and medication has also become available to help prevent relapse, but a cure has not yet been found. This means that even if an alcoholic has been sober for a long time and has regained health, he or she may relapse and must continue to avoid all alcoholic beverages. There are currently only three medications approved by the Food and Drug Administration (FDA) specifically for treating alcoholism. Antabuse (disulfiram) makes you violently sick if you drink while taking it, Revia (naltrexone) blocks the effects of alcohol in your brain, and Campral (Acamprosate) reduces your craving for alcohol. The effectiveness of any treatment program is in large part dependent on how willing you are to stop drinking. Research shows that only a small percentage of those who enter professional treatment remain sober one year later, but others have extended periods of sobriety interspersed with relapses. Even if you're not an alcoholic, abusing alcohol can have negative results, such as failure to meet major work, school, or family responsibilities because of drinking; alcohol-related legal trouble; automobile crashes due to drinking; and a variety of alcohol-related medical problems. Under some circumstances, problems can result from even moderate drinking. For example, when driving, during pregnancy, or when taking certain medicines. Over 15 million people in the United States have an alcohol use disorder of some sort. However, more men than women are alcohol dependent or experience alcohol-related problems. People with a family history of alcoholism are also at greater risk. In addition, rates of alcohol problems are highest among young adults ages 18-29 and lowest among adults 65 years and older. Among major U.S. ethnic groups, rates of alcoholism and alcohol-related problems vary. There is a line of thought that goes like this: "If you have to ask if it's a problem, it's probably a problem." Someone's official diagnosis is not important. If their drinking has become a problem for you or the family, then it's a problem. However, there are signs and symptoms you can look for as well. If you're diagnosed as an alcoholic, you can't just reduce your alcohol use without stopping it altogether. Studies show that nearly all alcoholics who try to merely cut down on drinking are unable to do so indefinitely. Instead, cutting out alcohol (that is, abstaining) is nearly always necessary for successful recovery. However, if you are not an alcoholic but have had alcohol-related problems, you may be able to limit the amount you drink. If you or someone you love has a problem with alcohol, call the Center for Substance Abuse Treatment at 1-800-662-HELP for information about treatment programs in your local community. Many people also benefit from support groups. For information on local support meetings run by Alcoholics Anonymous, call your local AA chapter (check your local phone directory under "Alcoholism") or call 212-870-3400. Check this page for a list of online meetings. For meetings of Al-Anon (for friends and family members in an alcoholic person's life) and Alateen (for children of alcoholics), call your local Al-Anon chapter or call the following toll-free number: 1-888-4AL-ANON. Check this page to find online Al-Anon meetings. Drinking during pregnancy can have a number of harmful effects on your baby, ranging from mental retardation, organ abnormalities, and hyperactivity to learning and behavioral problems. Moreover, many of these disorders last into adulthood. While we don't yet know exactly how much alcohol is required to cause these problems, we do know that they are 100-percent preventable if you don't drink at all during pregnancy. Changes in your body as a result of aging can make you more susceptible to the effects of consuming alcohol and increase the risk of injury or accident if you drink. Also, as you age, the more likely it is that your medications will interact with alcohol. Your body treats alcohol as if it were a toxin and tries to break it down and excrete it from your body as quickly as possible. As you get older, your metabolism can change, requiring a longer a longer amount of time for alcohol to metabolize. There are many different ways that alcohol affects women differently from men and some of them are related to the fact that women's bodies simply have less water than men. Not only can this affect the way alcohol makes women feel, it also affects some of the long-term health effects of alcohol. Several studies have reported that moderate drinkers—those who have one or two drinks per day—are less likely to develop heart disease than people who do not drink any alcohol or who drink larger amounts. Small amounts of alcohol may help protect against coronary heart disease by raising levels of "good" HDL cholesterol and by reducing the risk of blood clots in the coronary arteries. If you're a nondrinker, you shouldn't start drinking only to benefit your heart. Protection against coronary heart disease may be obtained through regular physical activity and a low-fat diet. And if you're pregnant, planning to become pregnant, have been diagnosed as an alcoholic, or have any medical condition that could make alcohol use harmful, you should not drink. A 12 oz. can of beer, a 5 oz. glass of wine, and a 1.5 oz. 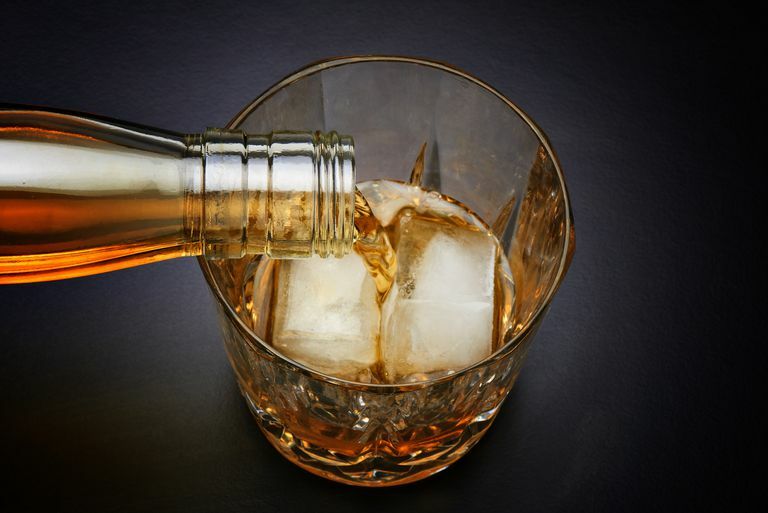 glass of whiskey, brandy, gin, or vodka are all considered one standard drink when it comes to the recommended guidelines for alcohol consumption. The Early Detection of Alcohol Consumption test is an algorithm of 20 blood chemistry levels, the results of which are compared to a database of test results from more than 1,700 heavy and light drinkers. It is used to determine if someone has engaged in any heavy consumption of alcohol in the past four to six weeks. You hear recovering alcoholics talk about having to hit bottom before they realized they had a problem and reached out for help. That means they ignored a lot of signals that they had a problem right up until the point that it finally got painful enough to seek help. According to research by Dr. Andreas Bartsch of the University of Wuerzburg, Germany, abstinence from alcohol enables your brain to reverse the shrinkage caused by alcohol and to perform better, but his research also shows that the longer you drink excessively, the more your brain loses the capacity for regeneration. If your diabetes is at the point where you require insulin to control your glucose levels, drinking alcohol is a bad idea for a number of reasons. Whether a DUI is a felony or a misdemeanor depends on the circumstances and on the state in which you were driving. Drunk driving charges are generally misdemeanors, but in every state and the District of Columbia, there are circumstances upon which your DUI charge can be upgraded to a felony. National Institute on Alcohol Abuse and Alcoholism. Alcohol Facts and Statistics. Updated June 2017.